t took me a little bit to remember that 7 or 8 years ago when I got my KitchenAid Artisan Stand Mixer, I got it at Ebay I just wanted a nice simple black one. So I went to check the prices of a new one and found out that Ebay was a cheaper place. I didn’t want to wait on an auction. I was looking at brand new ones, which is what I marked when I got to Ebay. I just wanted to buy it now. I found what I wanted and just bought it (after taking several hours to look at different websites). A few years ago, I think I paid less than $300 for it, but like everything, prices change. I have also bought attachments to it, a cutting board, flat, slotted spatulas that have plastic on the ends with metal in the middle (that you can’t buy in stores around my small town). I have bought several kitchen items off Ebay from the out-of-date to unusual to items of today. Just another site to check out and compare prices. Have you found out with MS that you are no longer able to cut, by hand, vegetables called for in that recipe you want to make? An electric chopper would make that task easier to make the recipe. Do you need the right size of pan for that pasta dish? Do you need a bigger mixer to make a bigger batch of fresh cookies? After all, not ALL the cookies need to go to the bake sale. You have to have some at home to eat too! Then just click on here to shop for the utensils , cookware, or small appliances you need to make the recipe easier to make. Do you have decreased hand strength and holding silverware is more difficult to eat? Look here to shop for “ableware” to put on your own silverware handles to give you a wider handle to hold on to. They are even dishwasher safe to make clean up easier. Then have it shipped to your home and you don’t have to go out and shop for them from store to store. Some places even deliver groceries so be sure to check that out in your area also! The newest appliance to make meals even quicker, easier and healthier is an instant One Pot. The instant One Pot Duo 6 Quart 7-in-1 programmable multi-cooker is a multi-use programmable cooker. 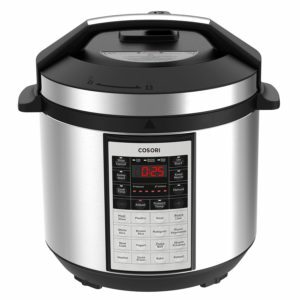 A pressure cooker, slow cooker, rice cooker, steamer, saute’, yogurt maker, and warmer. It comes with a stainless steel steaming rack with handles, rice paddle, soup spoon, measuring cup, a condensation collector, and a recipe book. To maximize performance, they suggest only using actual Instant Pot accessories. Plus it comes in 3-quart, 6-quart, and 8-quart depending on the size of your family. 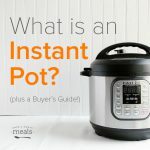 Information on the instant pot courtesy of Once A Month Meals (OAMM). OAMM has (recipes to freeze first) for the One Pot and they don’t even have to be thawed to use them! Just put the frozen meal in there and have it ready to eat in no time at all. I plan to get a COSORI 6 quart 8-in-1 programmable 1000 Watt multi-cooker. It has 6 different cooking functions; bake, saute’ and brown, boil, steam, slow cooker, and pressure cook. In addition to that you can use it as a rice cooker, saute’ pan, yogurt maker, hot pot, steamer and warmer. You can even cook eggs and bake cakes! It comes with a tempered glass lid for other than pressure cooking, a stainless steel steamer rack with handles, an extra silicone sealing ring, a ladle, rice spoon, measuring cup, and recipe book. COSORI has a 2-quart, 6-quart, and 8 qtart. Both brands are made in China, but researching for my own pick, 1 reviewer said she thought the steamer rack was heavier in the COSORI than the Instant Pot?! But for myself it seemed to be a personal choice. I think it’s like every kitchen appliance, you have to do some shopping and looking for yourself and compare features, use, and price. I think it will be nice cooking in the summertime. You have a good meal, but you aren’t heating up the stove and you don’t have to have the grilled food all the time if you want a break. I haven’t got mine yet. I’ll have more to report when I get it and get a chance to try it out, but my sister-in-law- LOVES hers she got for Christmas and finds it hard to use anything else. I’m not sure what brand she got, but she keeps it accessible for frequent use. It’s hard to get a whole meal at home much quicker than that!I’ll have more to report when I get it and get a chance to try it out. I also noticed, while looking at multi-cookers, Amazon sells many cookbooks dedicated to multi-cookers, dedicated to the KitchenAid Artisan Stand Mixers, and fabric covers for them both, extra sealing rings, and other accessories if you just look. Here is a COSORI multi-cooker cookbook. That I’m thinking about when I get my COSORI multi-cooker. That way I don’t have to figure out how to convert recipes from the web. At least until I learn how to use it. Once I learn about the multi-cooker, it won’t be a problem using other recipes! I also have a cookbook on this site to get recipes from a little quicker. My family’s favorite recipe that comes to mind quickly is for cream puffs. I only make these for special occasions because the recipe requires several eggs. I double the cream puff pastry recipe, but I make 1/2 a batch of the chocolate filling for half the pastries and use an already-made Bavarian creme filling for the other half of the pastries. I can’t have chocolate (yes I’ve gotten used to it! ), so since I’ve gone to the trouble to make them, I make some I can eat, too. I’ve also bought a pan from here. I broke the lid of my jellyroll pan and this was the ONLY place I found that pan and lid to replace it reasonably priced. I think it is a 11″ x 15″ size? A jellyroll pan is used for several of my older recipes from relatives. All I could find was half sheet or quarter sheet pans. I guess that’s the new size.